Psychologist Michael Price writes in his article on the subject: "Herding can be particularly destructive in market contexts, because blind faith in market trends by a swarm of individuals can lead to huge bubbles and devastating crashes." In the context of market behavior, however, individuals eventually pay the price for their unsophisticated exuberance, whereas the government counterpart all too often finds another scapegoat, typically citing a failing of the free market or a lack of government funding or latitude. In his article, Price refers to information access as another plausible cause for human herding, which he explains as a benefit derived from "knowledge that other group members have gained about, for example, the location of key resources." This psychological propensity proves extraordinarily precarious when met with the elements of taxation and a growing immunity thereto, where residents of a community begin to substitute attainable knowledge with an imaginary belief where a void of understanding has existed. In this case, the programmable person latches onto an expedient narrative, as if to appear informed on a given subject so as to avoid sounding foolish, which has famously served his fellow man despite the absence of even the most cursory evaluation of its assumptions or claims. Based on the litany of Hollywood and textbook depictions favorably championing the emergence of the United States of America, it has seemingly become a distorted expression of patriotism to empower the government which the Founding Fathers erected to preserve personal and local sovereignty through enumerated limits on federal powers. Over the course of generations indoctrinated by the frothy American fairytale, increasing numbers have deferred to this government as the omniscient body on allowable human behavior, where well-intentioned persons have expected positively perfect outcomes and have yet experienced only a great margin of failure masked by only further plans to finally perfect it. And while funds reliably go to waste through government investments, such as the $535 million Solyndra scandal, and regulations continue to cause unintended consequences, such as blowback or economic marginalization, the childlike constituency remains hopeful, as they did about Santa Claus during their infancy, that there is merit to the institutions which today bear only titular ties to the ennobled visions of those forefathers. On the whole, the bulk of this nation's population has succumbed to the sensation that this government represents not only them, but a cherished vision cultivated during their childhood, at 4th of July parties and in their minds while skimming their history books and listening to Tom Petty or Miley Cyrus. This has ubiquitously distracted them while they have been fleeced and force-fed a fallacious fairytale of Hollywood proportions and epic destruction. Future texts will hardly reflect favorably upon those who contributed, those who condoned and those who failed to recognize their own systemic slavery. In the end, taxation is theft, and any refutation serves only to obfuscate this truth and blend it with some seasonings of social imperatives or the spices of social good. Regardless of its ends, and apparently independent of its gruesome track record, it is and will always remain a form of theft. "The government already owns all of the land and we are here as guests of the government." This is profoundly illustrative of the logic sequence which underlies the philosophy of taxation. Now, whether this is true is actually immaterial to the discussion on owning oneself and the product of one's labor. And again, the timeliness of the situation, as implied by the word already, remains also immaterial to the character of these acts. Let's assume my coalition were to surround your family's house and they were to advise your family that they reserved the freedom to either stay or leave. If they were to stay, however, my coalition would ensure that they pay what we deem to be their "fair share." If they were to abandon the property, we might leave them alone. Under these circumstances, your family would be forced to respond to a situation which might otherwise fail to exist. Whatever the case, leaving would mean abandoning your material belongings and the abstract hopes of a life in that home. Remaining would mean submitting to systematic relinquishment of wealth. In both of these scenarios, your family would be robbed of their standard of living, even if only temporarily suspended, in addition to their material possessions and abstract aspirations. So while you may appear to possess some form of limited agency in this dilemma, as there always remains relative freedom, it is plainly one which was artificially and violently produced, in which case you and your family could only limit your losses, where the absolute gains would be reserved for the assailants. And while bank tellers reserve this same form of discretion in determining whether to surrender to the demands of bank robbers, they remain beset by thieves who have ostensibly given the tellers an ultimatum predicated upon the threat of losing their lives or some other unknown. Of course, in the case of protracted imprisonment, the threat issued by the United States government, the distinction between death and lifelong incarceration is hardly material. For most, there is hardly any distinction at all. Beyond this, the United States is actually one of the only nations in the world which taxes worldwide income, meaning that every American citizen and green card holder remains subject to the U.S. income tax regardless of where on this planet that individual resides. 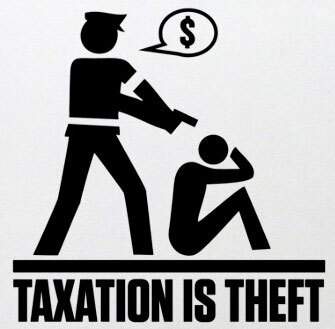 Theft merely requires an agent forcing a subject to comply against his or her will. In the case of one's family, irrespective of timing, they are being held responsible for a decision within narrow confines of discretion, just as is the taxpayer, who may elect to relocate, seek employment elsewhere, renounce his citizenship or simply commit suicide. All of these decisions would ultimately prove expensive for the subject, and they are directly consequent to the coercion of that coalition: government. And assuming that the property rights are indeed exclusively reserved to government, which is technically untrue, if a man stumbles onto your property, do you believe that you retain a right over him and his labor for this reported transgression? If so, what force or principle has endowed you with this right? These are the pressing questions which urgently require a response to justify the existence of that growing Leviathan of government. Now, some taxation sympathizers wage the notion that each of us has signed a sort of social contract purely by residing on this soil. Well, I will attest that I have personally never signed such a contract, but my consent is nonetheless popularly assumed by this cohort of sympathizers, on the mere basis of my residence. A similar consent-specific argument could be waged by suggesting that your belongings agreed to my possession by remaining where they presently are. We can take that argument even a step further to blame the stab victim for allowing his throat to remain in the path of the assailant's knife. Theft can take more fashionable or justifiable forms, yet it ultimately remains theft. And of course there are many tribes which have resided on this land for several centuries, far in advance of the formation of this nation's republic. If timeliness indeed influences one's outlook on this situation, how exactly might that individual reconcile the fact that those individuals, ancestors of those natives, are being subjugated by taxes wielded by a bureaucracy which is predated by those tribes? What's more, the 16th Amendment was freshly ratified in 1913, while the first payroll withholding tax appeared only during World War II in 1943, so even most present-day Americans' immediate ancestors settled in this country in advance of these measures; there are even many Americans alive today whose births predate them. The point is this: if any fraction of the product of one's labor is kept from him beyond the express consent of that individual, or without the capacity of both agents to reform the conditions of said contract, then that individual is being fleeced. This is a matter not of mere material possession, but of personal ownership. Indeed, you do own yourself, and the cost for that ownership is eternal vigilance against those unyielding forces which intend to curtail it. The greatest threat to liberty is the aspiration to define its terms, and the crystallization of this threat is realized once the public becomes paralyzed through its Stockholm-like acceptance. What's more, it is one matter to state that government owns the land, but one wholly separate to claim that it outright owns the ideas and production which emanate therefrom. If indeed anyone were to contend that this is true, then government would then be assumed party to all constructions now and into the future. In this case, we have a ubiquitous tyranny which threatens to imminently abolish every inch of liberty if we will allow it. As we emerge with the understanding that taxation is theft, we may begin to restore freedom by dramatically reducing the size of government and its expenditures. Whereas government spending constituted roughly 3 percent of GNP at the beginning of the twentieth century, it has ballooned over 40 percent of GDP today. The lion's share of this enormous expansion is attributable to the many dependency systems born out of the New Deal and Great Society movements. While the reformation will invariably prove painful, the cost of delaying this time of reckoning will prove only costlier. Above all, the price for freedom is a small price to pay, and history shows it is the most fundamental and worthwhile investment.